Designers (and developers too, of course) who stare at screens 24/7 often suffer from blurry vision, debilitating stress, and chronic headaches. It's an awful feeling, and it can even stop you from doing your work efficiently (or at all, in some cases). It's really not fun at all. One of the reasons for this is obvious: eye strain. Eye strain results in blurred vision and headaches, and after neglecting the underlying cause for too long, can begin to happen every day. Sleepiness and shoulder/neck ache is a symptom too, so next time you decide to "power through", remember what it's doing to your health, creativity and long-term productivity. Also, the blue light that's emitted from screens is very dangerous for your eyes as well. Here are 5 things that you can do to improve your eyesight when you work behind a computer every day, including a few nifty solutions for those stray blue lights. When you're fixated on a design, or some code, you forget to blink. Seriously, you blink less often, and this makes your eyes dry and irritable because your eyes aren't watering. When at the computer, you should follow the 20-20 rule. Every 20 minutes, stare at something 20 feet away for 20 seconds to relax your eye muscles and also force yourself to blink a little. Computers are required for the execution of design (and the lean, collaborative feedback workflow that comes with it). This means, that certain design processes such as iteration and prototyping can be done off-screen. 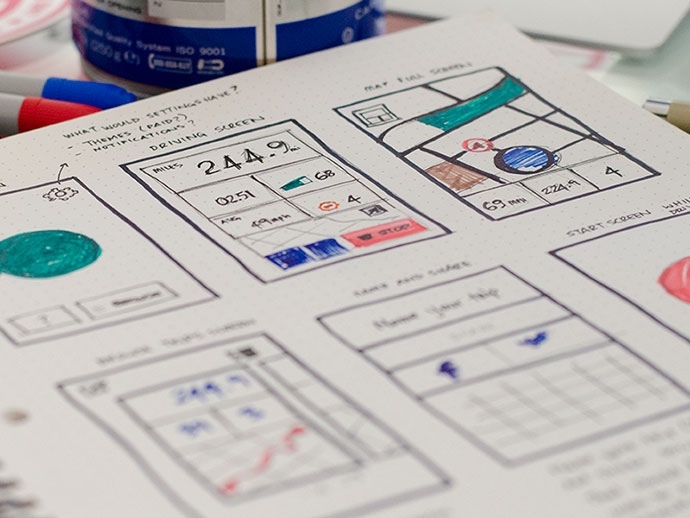 Have you ever tried paper prototyping? Exporting app sketches into Sympli, and even building upon them in Sketch, is easier than you might think. Give your eyes a rest from those blue lights. Work offline when the opportunity arises. 285 million of us worldwide are visually impaired (this includes everybody from low-vision to legally blind). If you've never worn glasses before, statistically speaking, you might need them even if you don't think that you do. Presbyopia is a rather common age-onset disease of the eye, where the elasticity of the lens makes it harder to see close range (i.e. the design on your screen). Over time your eyesight naturally deteriorates, but those that suffer from eye-strain on a regular basis will begin to feel the effects much sooner than normal. FYI: Presbyopia can be corrected, so if you're already feeling the negative effects of looking at screens too much, it's worth looking that up. Production of the sleep-inducing hormone melatonin is hindered by the blue lights emitted from handheld and desktop screens, and this is why many of us struggle to fall asleep at night. Blue light can also reach deeper into the eye and cause damage to the retina, so you shouldn't look at the screen too closely. It won't "make your eyes go square", as your Mother once told you, but those nasty blue lights will damage your eyes. Tip: if you're a macOS user, try turning on Night Shift mode. Night Shift makes the screen hues warmer, eliminating those evil blue lights that damage our eyes and keep us awake at night! If your eyesight is medically fine but you still have trouble with screens, consider where you work. Is there too much light? Is the angle of tilt on your laptop suitable for your desk height? If so you might want to try a standing desk, which is fantastic for your posture too. When you ask designers what specific tasks they spend the most time on, it's often coming up with an attractive visual design that's also not too difficult to implement, or figuring out the best way to handle a specific user experience. When you're "stuck", this can be very stressful; so much so that it's hard to walk away from it and call it a day. Designers and developers have an almost biological need to solve things, so walking away tends to feel a lot like giving up. If you feel yourself entering a sticky situation, ask for feedback. Sometimes the best ideas are so simple it's impossible to dream them, and they can even come from the most unexpected sources (friends, family, the guy who writes the blog posts, et cetera). Plus, your creativity dwindles when you're stressed. You're not alone. Feedback is always around the corner. Speaking of creativity, the world around us is literally filled with UX flaws, and you'll be a much better designer if you expose yourself to them. You'll learn how to solve UX more efficiently while resting your eyes from those toxic blue lights. Also, did you know that the color green can boost your creativity in immeasurable ways? Surrounding yourself with nature is super-good for your mental health, as well as a form of exercise and relief for your eyes. tl;dr green yes, blue no. Eye care is important. Here's a really interesting website that outlines the eye-care facts, and there's also a "Screen use" section that will certainly apply to us screen maniacs.